We’re delighted to be bringing Haiku Salut back to Manchester, for a Christmas outing of their Lamp Show! Two years after they brought their lamp show to Manchester for a glorious night at Hallé St Peters and three years since they staged the lamp show in the swimming baths of Indy Man Beer Con, Haiku Salut return for what is bound to be a magical night: a Christmas Lamp Show! Haiku Salut are a unique proposition, sweeping between all-manner of genres but never losing the soft focus of the inspired instrumentals that provide their back-bone. Rising from minimal, glitchy pop songs into moments of distinct and awe-inspiring grandiosity, the band match the intensity of their recorded sound with a mightily fetching, and suitably dramatic live show. If you’ve not seen the lamp show before, you’re in for a dazzling, exhilarating treat. 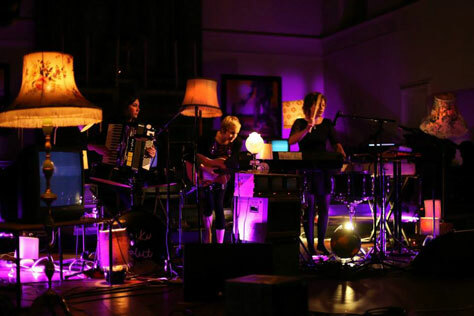 The trio perform with a stageful of vintage lamps which are programmed to flash, fade and flicker in time to the music – and result is utterly spellbinding, like watching electronica come to life. All of their previous lamp shows have sold out in advance, so getting an advance ticket is advised. Special guests are TV ME. TV ME is broadcasting. A three-piece project led by Thomas McConnell with tracks inspired by childhood, Playstations, memories of old computers and regurgitated pop culture. Their intriguing future-pop is inventive, catchy and importantly, audible. Through 2016 Thomas was known as Tom Low. He released the Phone EP on Deltasonic and toured with Mercury Prize nominee C Duncan. However, during the final months of the year he disappeared into recording a new project, composing everything from eccentric pop, musical suites to imaginary soundtracks. After drawing up diagrams for a new machine to release his music and tuning in with Adam Dixon and Frankie Tibbles, TV ME are now transmitting. Debut single Peppercorn Boy is out soon on Deltasonic.